First Church enjoys offering several all-church meals throughout the year. Home Fellowship Gatherings: Sponsored by the Deacons on a quarterly basis, we gather at a church member’s home in an atmosphere similar to that of an open house. People bring something to eat or drink, and they arrive and depart at their convenience. It’s a fun and relaxed time of getting together and building friendships. Dinners for Nine: Everyone gathers in the Parish House for appetizers, and then they are split up into smaller groups (about nine people) to have dinner and dessert in host homes. Host homes offer the main course, and guests supply the rest of the meal. 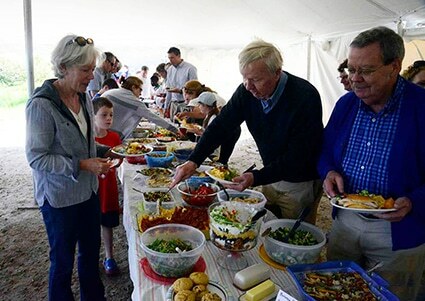 Rally Sunday Picnic: Is offered after church on Rally Sunday at either Beech Hill Farm or Gould Hill Farm (alternates annually between the two locations). Everyone is invited to bring a dish to share. End-of-Year Barbecue: Is offered after church on Youth Sunday. The Senior High Youth Group grills hamburgers and hotdogs for a small donation toward their summer mission trip.